We were at DunDraCon, working our way through a yearly alcoholic binge, and at the same time playing the newest geek-game, Six Degrees of Bruno Faidutti. I knew Eric thought he had me stumped, and not just because of the quirky smirk on his face. He knew--hell, we all knew--that Reiner Knizia had clearly and publicly stated that he didn't do collaborations. He appreciated the heck out of his playtesters, but his core designs were his and his alone. But I had something in my back pocket--a pair of serial collaborations that were easily overlooked. I'd been hoarding them all night waiting for just this opportunity. "Four," I said and smirked myself as the smile dropped off Eric's face. "Knizia revised Jurgen-Wrede's classic as 'Carcassonne: The Castle'. It was also revised by Leo Colovini as 'Carcassonne: The Discovery'. Leo Colovini and Michael Schacht designed 'Magnus Grecia' and Michael Schacht and Bruno Faidutti designed a couple of different games, of which you've played 'Fist of Dragonstones' and 'The Hollywood! Card Game'." And then Eric's face lit right back up. He'd been playing me. "I can top that at three," he said. "Colovini and Faidutti directly collaborated on a little-known 2001 game called Vabanque. That cuts out Schacht and drops the Faidutti number by one." I sighed and signalled to the waitress that I'd be paying for the next round. We were up to green in the Rainbow and so I ordered everyone grasshoppers. Despite the loss, I was feeling good. Collaborations are a common event in the gaming landscape, much moreso than in any other creative endeavor at a similar level. Perhaps there's more opportunity for rampant, chaotic creativity before the hard work begins. Perhaps it gives you the advantage of having someone else to fix the mistakes you can't see, a sort of in-house developer before you hand your game off for actual development. In any case, there are several designers who constantly collaborate, sometimes with a single friend, sometimes with many. Collaboration itself can encompass many types of creative interaction. I've experienced a very personal, direct sort of collaboration, where a friend and I brainstorm in real time, writing down notes as we come to agreement, then I head off to clean that all up, and sort out anything we missed before I bring it back for another round. Bruno Faidutti, meanwhile, talks about a much more indirect form of collaboration, where he and his collaborator might go off with just the most basic ideas, and then come back with two games whose best mechanics are then integrated. Of course this can also result in two different games. Serial collaboration involves a new designer coming in and iterating an existing game system without necessarily working with the original designer. Thus we've seen two serial designs of Carcassonne (The Castle and The Discovery) and numerous serial designs of the Empire Builder system. Bruno Faidutti just recently did a serial design of Warrior Knights. Development is a slightly different bird, as usually the developer's role is considered subsidiary and somewhat invisible. However some development is big enough that the developer's name ends up on the box next to the designer's, and I think when it reaches that extent you'd have to call that a collaboration too. I'm thinking primarily of Fantasy Flight Games here. I know how extensive the work that Kevin Wilson did on Arkham Horror was, and I'd suspect that Darrell Hardy's contribution to Runebound was similar. There's no doubt to me that the Kevin Bacon of our gaming industry is Bruno Faidutti. He's done multiple collaborations with other designers in France, including Bruno Cathala, Serge Laget, and Ludovic Maublanc. But he's also crossed national lines and collaborated with Italian Leo Colovini and several Americans including Alan Moon and Mike Selinker, as well as German Michael Schacht. Though he's the center piece for my "six degrees" game (and I think quite a well-warranted one), Faidutti is far from the only well-partnered designer. Another nexus point in a graph of designer collaborations is Leo Colovini himself. Besides his own Venice Connection (founded with Dario De Toffoli and Alex Randolph) he's also collaborated with several Italians, with Frenchmen Duccio Vitale and Bruno Faidutti and also with Michael Schacht. What particularly strikes me about European collaborations is that they generally seem to be at a personal level. You have designers working with each other across international lines, with nothing in common but their games. It's pretty rare that they form companies together (with Venice Connection being that rare exception). Instead they work together in a dynamic fashion when they feel like it. 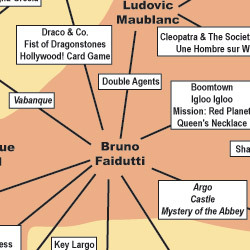 The power of Bruno Faidutti is such that his reach extends both across the Atlantic and across time. Tracking from his designs out through collaborators' collaborators we shortly come to Fantasy Flight Games, Hasbro, and Cheapass Games, three modern game companies. 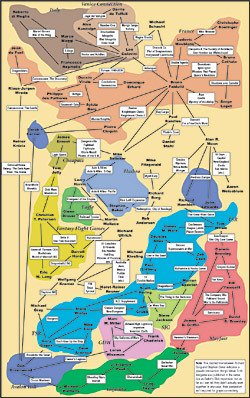 In addition (thanks to Don Greenwood, Alan Moon, and Mike Selinker) we encounter the American game companies of the 1970s and 1980s: TSR, GDW, Yaquinto, the old Avalon Hill, and the Old Mayfair. The American companies are notable for how different they are from the European collaborative model. Here collaboration is done because people work together, and there's a much higher incidence of designers actually working at companies. That's how Alan Moon got his start after all, at Avalon Hill and Parker Brothers, before he moved on to independent work and the European collaborative model. Cheapass and Fantasy Flight still seem to work much like those older companies, so it's not just an issue of age. At right you'll find a link to my complete chart of collaborations. Click on it to view an ~800x1300 copy of the entire graph. It should be fully readable at screen resolution. I traced through all of Faidutti's major collaborators and extended out from there until I'd filled a bit more than an 11x17" sheet of electronic paper. I'd originally expected to have a few dozen designers, probably segregated into a couple of different communities. I expected to see Faidutti's collaborators, Kramer's collaborators, and the people who've been working with Fantasy Flight Games, but I didn't think they'd connect up. I quite enjoy the fact that the graph constantly loops. When I got down to AH's Don Greenwood on one side of the graph and Mayfair's James Griffin on the other I realized that I could connect the two sides of my graph through Yaquinto, and I did, even though I'm not familiar with most of those designers. 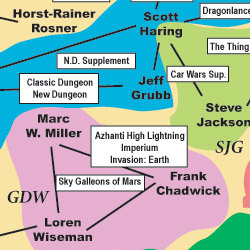 I also enjoy the connections that Cheapass and Eagle both form between Hasbro and Fantasy Flight and I was quite happy when I discovered that Derek Carver formed a second connection down to Don Greenwood of Titan fame. And who's the designer that's the most degrees removed from Bruno Faidutti? That'd be Bruno Faidutti, at 16, forming a perfect circuit. He designed several games with Michael Schacht who designed Magna Grecia with Leo Colovini who connects up to Klaus-Jurgen Wrede then Reiner Knizia through Carcassonne: The Discovery and Carcassonne: The Castle. Knizia's work was revised by Don Greenwood as Titan: The Arena, who forms the start of the Yaquinto chain that goes through Michael Matheney (Circus Maximus), J. Stephen Peek (Shooting Stars), Craig Taylor (Shenandoah), and Neal Zimmer (Naval War). This brings us up into Mayfair where we connect up to James D. Griffin with Hammer's Slammers, to Bill Fawcett with a variety of games, and to Darwin Bromley with the classic Empire Builder. Still in the 1980s we connect to Tom Wham for Iron Dragon then to Richard Hamblen for The Great Khan Game. We're then greeted by Alan Moon who designed Fortress Europa with Hamblen and he brings us back to the present with his two collaborations with Bruno Faidutti, Diamant and For a Few Orc's More. What a fantastic piece of work! I nominate this for "2006 Post of the Year." I'm not sure about the value of the result, but the effort was surely very impressive! Pretty much how I felt, Dave;). Knizia shares design credit with Kevin Jacklin on the game Hollwood Lives. Kevin Jacklin has a credit in the Call of Cthulhu Creature Companion, which means that Shannon is more closely linked to Knizia than Faidutti is! Good going, Doug. I'd tried to figure out how to make that connection to me, but couldn't even falling back on roleplaying books;). More importantly, that gives me a Faidutti Factor of 5.
the graph is impressive - I tried to find a way to move Knightmare Chess into the SJG area, but couldn't. I'd all but forgotten that the Knightmare Chesses were SJG. I can actually see how to bring them together, by moving the FFG/Hasbro/Eagle/Cheapass branch, but it's a pretty huge amount of work. Maybe on a future iteration;). Nice job. I don't suppose you'd consider going landscape with it? It'd make for an interesting desktop wallpaper. Insanely impressive job, Shannon. I can't wait to do a flow analysis of your chart! :-) But, given the emphasis you placed on American designers, I'm surprised you didn't mention Rob Daviau and Craig Van Ness from Milton Bradley/Hasbro. Both have design credits with Larry Harris and Stephen Baker, as well as, of course, each other. And I can hardly wait to see what you do with Stonehenge, the proposed multi-design with five games in one, each using the same components, and each contributed by a different designer. Richard Borg, James Ernest, Bruno Faidutti, Richard Garfield, and Mike Selinker all (kind of) collaborating on the same game! There's a chart buster for you! Of course what can get really whacky is if you consider that Alan Moon (who worked at AH BTW) did development on Down with the King so much that some would say that it eventually became his game. If you consider that you then have a connection with the Rahmans. From this you can move out quickly to Lance Gutteridge (Insectors) from there you move to Tom Dalgliesh & Ron Gibson which opens up a whole new section (Columbia games, Gamma Two Games, and then of course more AH stuff). It might be worth noting that Mike Gray used to work at the old AH, then WotC and now works the new AH at Hasbro. Generally: based on the great feedback I've gotten, I'll probably do a second edition of this in a couple of months, so keep letting me know about those big names, connections, and game company afiiliations that I missed. "Down with the King" is the sort of thing that I wouldn't have found on my own because Alan Moon isn't credited as a designer. But, if his effort was that large, it's appropriate. On Wallpaper: I actually purposefully made this vertical so that you could scroll it on a computer screen in the expected way, so no plans for a landscaped version. It would take pretty huge amounts of effort to turn everything around. On American Designers: I actually didn't intend to put an emphasis there, it's just how the chart laid out, though I'll have to admit I made the extra effort to include big RPG names like Gary Gygax, Dave Arneson, Steve Jackson, and Jeff Grubb. Generally the American designers seemed to have a higher percentage of collaborations, I think because of that corporate grouping I noted. Stonehenge: My initial inclination is to keep it out of the chart because it's not a true collaboration. It's more like that Borg/LotR collaboration I note, which only went on the chart because it was covenient. My only question is that there is a blue blob above TSR to the right that isn't labelled. Should there be a label for Richard Hamblen and John Edwards? I second the nomination for "post of the year"
Blue Blobs: It's all Avalon Hill, which ended up oddlys scattered across the chart. Posters: I definitely considered it. I do have this all as an Adobe Illustrator file, so I have the resolution. Anyone want to say either, "Do a poster now", or "I'd prefer to wait for a revised version in a few months."? Amazing. It's really more a work of art than a graph or chart and the closer I look at it the more I like it. Steve Jackson has a Faidutti Factor of 6 (Carver, Greenwood, Gygax, Winter, Haring, Jackson). Steve Jackson designed _Tribes_ with David Brin (FF7). David Brin wrote the _Heart of the Comet with Gregory Benford (FF8). Gregory Benford wrote _Beyond the Fall of Night_ with Arthur C. Clarke (FF9). Arthur C. Clarke appeared in _2010_ with Elya Baskin (FF10). Elya Baskin appeared in _New York Skyride_ with Kevin Bacon (FF11). Bruno thus has a Bacon Number of 11 or less. I have a Bacon factor of 6, since Steve Jackson published Knightmare Chess! Fantastic. But please educate me... Where did SPI fit into the whole mix? In several different fields, analogous studies were performed. *) In mathematics, collaborations as authors of a scientific papers are counted. The lowest number of collaborations necessary to connect you with P. Erdoes (a famous mathematician) is your Erdoes number. For instance, since I have collaborated with M.Goossens, who in his turn has written a paper with W.Van Assche, who is a co-author of A.Mate, who in his turn authored a paper with P. Erdoes, my Erdoes number is at maximum 4. Also, it can't be lower, since none of my co-authors is in the list of people with Erdoes number 2. *) In the field of computer security, webs of trust can be computed. A connection between two people is made when I sign somebody's public key, and that person in turn signs my public key. You can find a lot of information on Joergen Cederloef's website . I bet a lot of his conclusions can be applied to your graph, too. You could make Faidutti numbers for all game designers! At least one connection to SPI can be drawn through Steve Winter's work on the _Sniper_ supplement. From there you can jump to James F. Dunnigan, Redmond Simonsen, and then a large number of SPI authors, as well as West End Games.